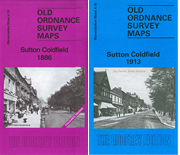 Covers the area north of Sutton Colfield incl Moor Hall, Four Oaks Station, Doe Bank, Little Sutton, Lady Wood and Four Oaks Park. Covers Railway Station, Reddicap Hill, Sutton Town Station, Tudor Hill, St Joseph's RC School, Holy Trinity Church and Crystal Palace Promenade Gardens. Covers Holy Trinity Church, Cemetery, Sutton Park Station, Reddicap Hill and Railway Station. covers Wylde Green House, New Hall, Wylde Green Station, Driffold and Boldmere. Covers Aston Park, Aston Villa Football Ground, Railway Station, St Peter & St Paul's Church, Witton Bridge, Cricket Ground and Aston Barracks. Covers Aston Station, Aston Reservoir, Erdington Hall, Shepherd's Green House, Salford Bridge and Erdington Arms Public House. Covers Aston Station, Salford Bridge, St Clements Vicarage, Site of Erdington Hall, Aston Reservoir, Gravelly Hill House. Covers Her Majesty's Prison, Hockley Station, Warstone Lane Cemetery, St Cuthbert's Church, Winson Green Station and Winson Green Station. Covers Icknield Port Road Station, Christ Church, Monument Station, The Oratory, Rotton Park Reservoir, Bingley Hall and Summerfield Park. Covers Railway Station, Beech Lanes, Queen's PArk, St Joseph's House, Lightwoods Park, Woodbourne Lodge and Metchley Abbey. Covers Edgbaston Hall, Harborne Hill House, Somerset Road Station, Kelton House and Waterloo Gardens. Covers Harborne Hill House, St Bartholomew's Church, Edgbaston Hall, Botanical Gardens, Part of Edgbaston Park and Calthorpe Fields. Covers California, Harborne House, St Peters Church, Harborne Park and Golden Cross Public House. Very busy map from Tower Road in the northdown to great Brook Street. Incl St georges Church, Gas Works, Walmer Recreation Ground, St Mary's Vicarage and St Matthews Church. 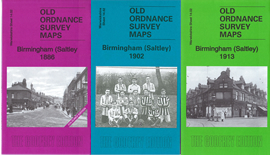 Covers Washwood Heath, Nechells Paek, Vauxhall Station, St Joseph's School, Saltley Works, Saltley Farm and St Saviours Church. Covers Saltley Station, Bennett's Hill House, Emmanuel Church, Vauxhall Station, St Joseph's Church, Washwood Heath and St Saviour's Church. 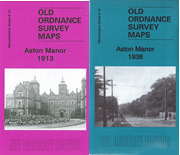 Covers Wardend Hall, Stechford Hall, St Margaret's Church, Hodgehill Common, Stechford Bridge and Fox & Goose Hotel. The heart of the city in colour, incl New St, Snow Hill, Curzon St stns, St Martins, St Bartholomew, St Phillip's Churches and Smithfield Market. Covers Brodesley Green, Little Bromwich, Gloucester Junction, Adderley Park and St Andrew's Junction. Covers All Saint's Church, Railway Station, Infectious Diseases Hopsital, Blakesley Hall, The Retreat, The Sycamores and Alum Rock. Very busy map - includes Calthorpe Park, Camp Hill & Balsall Heath Station, Highgate Park, St Aloban's Church, St Luke's Church and Pickwick Cricket Ground. 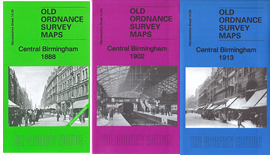 Covers Birmingham Small Arms Factory, Hay Hall, Bordesley Junction, St Oswald's Chruch, St Cyprian's Church, Victoria Park and Emmanuel Church. In fact mostly a Worcestershire sheet (6.11) Covers Waterloo Brick Works, School, Yardley House, Rockingham House and Bulls Head Inn. 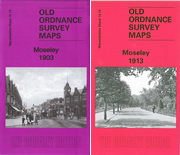 Covers Moseley Hall, St Mary's Church, Brighton Road Station, Cannon Hill Park, Moseley Park, Balsall Heath Park and St Anne's Church. 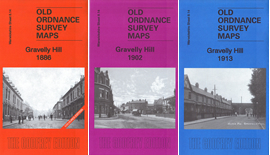 Covers Sparkhill Park, Tyseley Junction Station, St Bede's Church, Taylor Memorial Home, Showell Green and Burbury Brick Works. Covers Moseley Golf Course, Kings Heath Park, Highbury Park, All Saints Church, Highbury and Uffculme Homes, Kings Heath Station, The Priory and Moor Green.